If you have ever been to a land based casino, there’s a 50% chance the name Grosvenor was above the door. They are the biggest casino network in the UK and have come out guns blazing in the online gaming world too. Owned by The Rank Group, Grosvenor is a respected brand with almost 50 years’ worth of good behaviour behind them, making them a casino that players can trust. 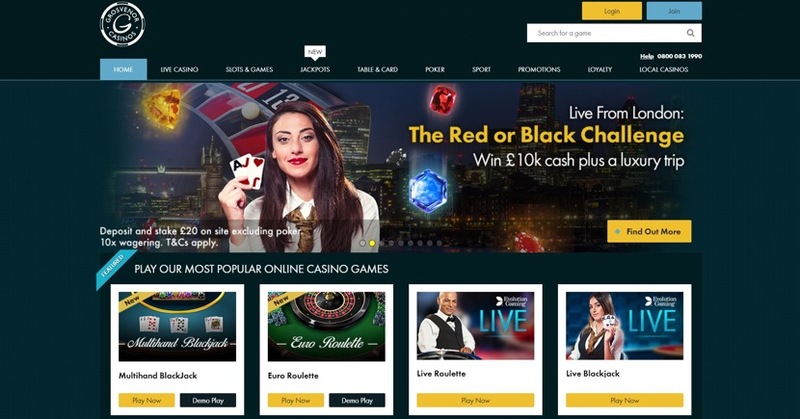 They deliver a website which is more than worthy of your attention too, with big name developers coming out of their ears, a popular Poker offering and a few awards to boot. While this all sounds fantastic there are a few gremlins in the system, so read on to see if they are enough to put you off. Grosvenor set out their stall in an orderly fashion and let the content do the talking. That’s a nice way of saying that their site is a little bit boring. However, it is extremely user friendly, easy to use and quick to respond, and more importantly, plays host to a great set of around 500 games. The no-nonsense approach lets players get straight down to the gaming, which is easy to do thanks to the clearly laid out task bar and large white game tiles standing out against the plain black background. We instinctively knew where to find what we wanted. We could have done with a bit more in the way of filtering options, but there is a search bar. Games load in a respectable time and as is the norm these days everything is instant play; the only desktop download content is for Poker. There is a lot of choice when it comes to games as they have picked the best of the crop from a multitude of developers, providing players with great options. Pragmatic Play, Microgaming, IGT, Barcrest, Yggdrasil, Ash Gaming, NetEnt – you get the picture. We must say, though, that we found one or two oversights and the odd bug: a roulette game going full screen when we laid a chip and a disappearing Live Chat button for example, not to mention the automatic logging out issue; and although these are minor grievances in the grand scheme of things you would expect a company like Grosvenor to have these sorts of issues in hand. 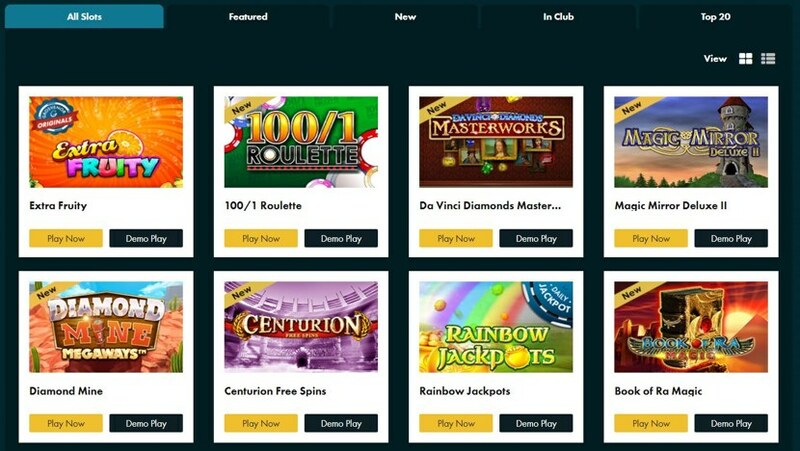 Slots – Slots number 370 and growing, which may not be as many as some other sites can boast, but Grosvenor aren’t carrying any dead wood here. Book of Ra, Cleopatra and Starburst are all available, as well as new titles like Mike Tyson Knockout Slot and White Rabbit. Jackpots – Mega Moolah has to get a mention, but that is just one of the 16 Jackpots waiting to be won. Arcade Bomb is another interesting one with a cracking soundtrack. 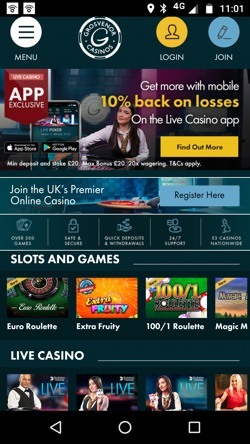 Live Casino – Roulette, Blackjack, Baccarat and Poker make up the 30+ games, with exclusive UK dealers and table limits largely matching Grosvenor’s land based casinos. Brought to you by Evolution Gaming. Table Games – There is a classic mix of 20+ games here including the obligatory Roulette and Blackjack variations, as well as the lesser spotted Game King Jacks or Better and Ten Play Draw Poker. Poker – Learn your ‘tells’ and try your hand by downloading the dedicated Poker offering which offers something for beginners and pro’s alike. Daily promotions, bonuses and poker satellites await. Tip: The Live Chat icon next to the search bar only appears on the Homepage; if you navigate to Jackpots, for example, it will disappear. Took us ages to figure out where it had gone. The mobile site and app actually come across with a slightly different tone to the desktop version. They feel more playful and fun, less pragmatic and business-like. Both are well laid out, with the games front and centre and a Menu button being the only way to navigate further. You can’t do much in the way of filtering though – there isn’t even a search bar. There are separate apps for Casino, Sport, Live Casino and Poker, but downloading one seems to give you access to them all, and actually, we found the app to be considerably slower and less responsive than the mobile optimised site so our advice would be to avoid them. Grosvenor were a bit slow on the uptake with their mobile offering, but these days it can confidently hold its own, and you will find that a good 75% of the games from the desktop site are also available on the move. Grosvenor haven’t gone overboard with the options here, but you certainly shouldn’t struggle to find a payment option you like the sound of, the main players are all available. Low deposit minimums will be a welcome site for those on tighter budgets, and there are no fees to deposit or withdraw. So far so good. Withdrawal times are where things come unstuck. 3-7 days? That seems crazy to us, although we were advised it is usually much quicker and that the stated time frame is just to cover their own backs in case anything goes wrong – but still. The Grosvenor story started in 1970, decades before the internet itself let alone online casinos were born. The passing decades have seen the company grow to operate 55 physical casinos and hold the title of the largest casino network in the UK. This is largely thanks to the takeover of 19 casinos from Gala Coral Group in 2013, but Grosvenor have made some other shrewd moves over the last decade, one of which being their partnership with Redtooth Poker which made Grosvenor a real destination for Poker fans. Not to mention the partnership with Fulham FC, bringing them attention from football fans nationwide. They have also been spearheading the advance in gambling technology, creating the worlds first multi-site cloud casino experience – the IGT Cloud. As if that wasn’t impressive enough they introduced a brand new game to the industry in Pinball Roulette back in 2012. 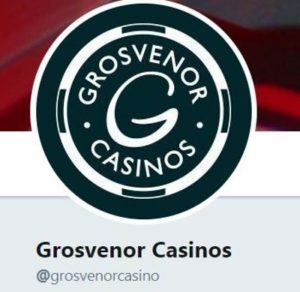 Grosvenor is operated by Rank Group who also own Mecca Bingo, and Rank was awarded the ‘Socially Responsible Operator of the Year Land Based’ award in 2014 and 15. This maybe explains why there has been so little controversy surrounding the company over its life, as the only notable bit of gossip is the fact that staff walked out in 2006 over pay disputes. This was obviously dealt with satisfactorily, however, since today Grosvenor employs over 6,300 staff and in 2014 reported a revenue of £391.2 million. The website suggests calling your local Grosvenor Casino first, although we aren’t quite sure why that might be. Nevertheless, there are plenty of other options available to you. The Live Chat works very well as a separate pop up window, incorporating a notification sound when you have a response so you aren’t left staring at the screen and wondering if the Customer Champion (as they hilariously call themselves…) has gone to make a brew. You can also e-mail, call or tweet, and you will be able to get hold of someone by at least one method 24 hours a day. We found everyone we spoke to prompt and helpful without any of the smiley face bells and whistles, which is fine and fits in with the brand. It’s worth mentioning that as a land based casino Grosvenor are known for their commitment to social responsibility, and it is likely that the same can be said for their online offering too. Peace of mind for anybody new to online gambling. Live Chat – A 24/7 service available through the website. There is an easy to miss icon at the top of the page in blue. Email – If it’s not urgent then support@grosvenorcasinos.com should get you a timely response. Phone – Call 0800 083 1990 between 8am and midnight to speak to a real life human being, if the thought alone doesn’t terrify you. @Grosvenorcasino – With over 120k followers this must be an account worth following. Address – PO BOX 70695, London, SW1P 9ZR is the given address, but: RANK Group, TOR, Saint-Cloud Way, Maidenhead, SL6 8BN is the address of the licensee.